The best and the brightest NASCAR Busch North and NASCAR Whelen Modified Tour teams spent their Monday testing at the one-mile New Hampshire International Speedway this week in preparation for July’s race at the track. Both events will be held on Friday, July 15th and are among the biggest races on the schedules of each series. NHIS also provides a point fund and awards a track championship to the top point getting in each division over the course of the July and September events at the track. Speed51.com will have extensive coverage of all of Busch North and Modified events at New Hampshire this July and we’re already gearing up for it. For information on how to get tickets for the NHIS races, please visit www.nhis.com or call their guest services department at (603) 783-4931). It’s one thing for a company to write a check to become a sponsor of an event, race team or series and enjoy the exposure that their logo gets at the track. It’s another thing for a sponsor to really get involved in short track racing. Stafford where he will run a USAC Silver Crown car. On Saturday, July 16th [the night before the Nextel Cup event at New Hampshire International Speedway], he’ll be driving a Late Model at Wiscasset. Then on Thursday night July 21st, Schrader will drive an ACT Late Model at Thunder Road in their weekly show. Kirk Alexander has a pretty good record going in True Value Modified Racing Series competition this year. If he doesn’t get disqualified, he wins. Alexander continued this streak last weekend by taking the victory in the TVMRS event at White Mountain Motorsports Park (NH). NASCAR Nextel Cup driver Ken Schrader will be coming to New England for a little bit of summer rest and relaxation in July. Schrader isn’t coming for the lobster, mountains or beaches though. He’ll be in coastal Maine, but he’ll be busy at Wiscasset Speedway. He’ll be in the Green Mountains of Vermont, but he’ll be occupied at Thunder Road Speedbowl. He's be in Connecticut, but not enjoying the lakes of the Stafford Springs area either. This season, Whelen Engineering joined the NASCAR Modified Tour and NASCAR Southern Modified Tour as the title sponsor of both series. This past week, they showed how much they enjoy being a part of the tour. Last Friday, Whelen held an open house at their Connecticut headquarters. Over one dozen Modified Tour teams and drivers showed up to meet the Whelen employees, customers and a number of race fans who found their way to the celebration. The drivers and their teams were given tours of the company plant and a good day was had by all. Waterford, the Whelen 150 actually. 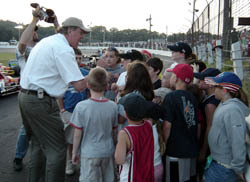 Of course, there were plenty of employees and VIPs on hand at the track, but the most welcomed guest of Whelen might have been a group of Whelen employee’s children who were there to catch the sights and sounds of racing firsthand. The children were the grand marshals of the event. The children gave the command for drivers to start their engines prior to the race. 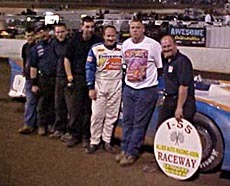 Ken Schrader is no stranger to short tracks. 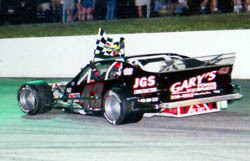 Veteran photographer Howie Hodge and NASCAR Whelen Modified driver Chuck Hossfeld teamed up to get this amazing shot. 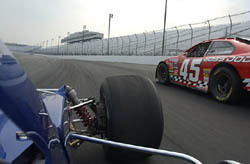 Hodge mounted one of his cameras on Hossfeld's car during the NHIS test and Hossfeld shot this photo when he was sharing the track with Brian Hoar's #45 Busch North machine. Alexander crossed the line second at the season opening TVMRS race at Monadnock, but his carburetor wasn’t in agreement with the rulebook that night, so he got a DQ. Alexander came back next to win, and pass tech, at Lee USA Speedway (NH), Seekonk Speedway (MA) and Monadnock again. Then came an interesting turn of events at Star Speedway (NH) where a questionable call was made against Alexander for rough driving and then in the confusion that ensued, Alexander parked on the frontstretch to argue the call, got towed away and then DQ’ed. So once again Alexander came back to silence everybody by simply winning another race. This time at WMMP. Finishing behind Alexander was Louie Mechalides and Jack Bateman. Because of the feast of famine nature of Alexander’s season, he is currently ranked fourth in points even though he has won five of the seven events so far in 2005. The True Value Mods will visit Monadnock again this weekend with a Saturday race scheduled at the high banked quarter mile oval. It’s been a busy week in the offices of the American Canadian Tour. Several new programs were announced by the sanctioning body this week. The final three events of the ACT Late Model Tour are the most prestigious races of the year, so a special mini-season has been put together featuring the Labor Day Classic at Thunder Road Speedbowl (VT), the Late Model Nationals at Lee USA Speedway (NH) and The Milk Bowl at Thunder Road. It has been dubbed the ACTion Super Series with each race paying $10,000 to the winner. The purse isn’t just a top-heavy one either. An additional $10,000 point fund will be available to the top 20 drivers who earn points in the "B" Feature races. Drivers who finish fifth through 15th in each race will be entered into a drawing with the winner receiving a trip to Las Vegas. Last season, hockey fans in attendance for the Banknorth Oxford 250 were treated to Boston Bruins great Ray Borque as the event’s grand marshall. This year, it will be time for the baseball/racing fans in the stands to rejoice as Red Sox great Rico Petrocelli will be named as the grand marshall for the July 31st event.